A woman, travelling alone through time, Africa, and unnamed lands, searches for Dr. David Livingstone, celebrated by the West as a "discoverer" of Africa. A woman, travelling alone through time, Africa, and unnamed lands, searches for Dr. David Livingstone, celebrated by the West as a “discoverer” of Africa. Throughout her quest, for knowledge and for Livingstone, the traveller visits many peoples, listens to their stories and their silences, and learns about their Silence. Suspense, parables, and dreams play major parts of the story twists and turns toward the traveller’s confrontation with Livingstone – I presume. 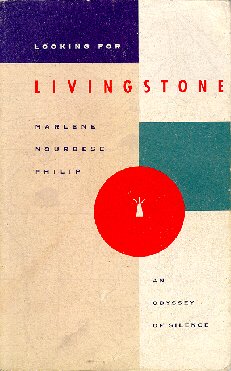 Looking for Livingstone explodes Western assumptions about the “silence” of indigenous peoples; this is one elegant and compelling novel which beautifully gives voice to the ancestors to whom it is dedicated. M. NourbeSe Philip is a poet, writer and lawyer who lives in the City of Toronto. She was born in Tobago and now lives in Canada. 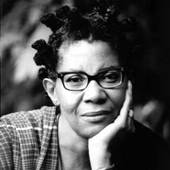 Although primarily a poet, NourbeSe Philip also writes both fiction and non-fiction. She has published three books of poetry, Thorns – l980, Salmon Courage – 1983 and She Tries Her Tongue; Her Silence Softly Breaks – 1988 and has been the recipient of Canada Council awards, numerous Ontario Arts Council grants and was the recipient of a Toronto Arts Council award in l989. In l988 she won the prestigious Casa de las Americas prize for the manuscript version of her book, She Tries Her Tongue… She is also the l988 first prize winner of the Tradewinds Collective prize (Trinidad & Tobago) in both the poetry and the short story categories. Her first novel, Harriet’s Daughter, was published in l988 by Heinemann (England) and The Women’s Press (Canada). This book was one of two runners up in the l989 Canadian Library Association Prize for children’s literature. Harriet’s Daughter was also first runner up in the Max and Greta Abel Award for Multicultural Literature. In 1990, she was made a Guggenheim Fellow in poetry and in 1991 became a McDowell Fellow. Her short stories, essays, reviews and articles have appeared in magazines and journals in North America and England, and her poetry has been extensively anthologized. Her work – poetry, fiction and non-fiction is taught widely at the university level and is the subject of much academic writing and critique.